Warning: Information on this page is given in good faith but you should be aware that any modification to a controller is done entirely at your own risk and will invalidate any guarantee. 4QD will generally not service controllers that have been modified. In general, all controllers made by 4QD are designed to work over a wide operating voltage range: the limits are set by the operating voltages on the MOSFETs and maybe other semiconductors, the relays and by the power dissipation in the current source transistor used for the internal supply. See Pro, Scoota, NCC and VTX series controllers. Internal power supply and protection circuitry for a description of how the powering works. The powering arrangements on the Uni are similar. This means that essentially the same controller may be used on 12, 24 or 36 with only relatively minor changes. 48v operation is not quite so simple as this can rise to voltages well above the specifications of many common semiconductors, so several semiconductors are changed. It is therefore not possible to modify a controller to work on a voltage higher than that for which it was originally specified but a high voltage controller may be used at lower voltages by altering or removing the relay dropper resistor. However, in general the 12v, 24v and 36v versions use the same components, but see note on 36v operation. The relay manufacturer specified an operating voltage tolerance of typically 80% to 160% at an ambient temperature of 25°C. 36v and 48v controllers have a resistor in series with the coil. The diagram below shows where this resistor is fitted (board issue 30-61-08). Beneath the resistor is a scratch-through consisting of two large copper lands with a thin track between. This track must be cut when fitting the resistor (or the resistor will be bridged out). 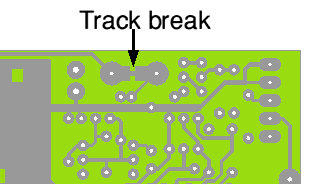 The undersirde view of the board shows this track break. For 36v, value is 220 Ohm 1 Watt (Half the coil resistance). See note on 36v operation. Warning modifying 12v relays for operation at higher voltages is not recommended as components will get hot, especially at higher voltages. Warning: these values were correct at the time this page was written but several different manufacturers make the relay type used. If the coil resistance changes, so too will the value of this extra resistor. Generally the same MOSFETs are used for 12v, 24v and 36v. Only the 48v version uses different MOSFETs. The current source on 12v, 24 and 36v controllers is a TO92 transistor delivering about 30 milliamps. At 36v this drops some 28v so dissipates about 700mW so gets very hot! At high ambient temperatures this could fail. On 48v it would self-destruct (over 1 watt) so we fit a second dropper transistor and change resistor values to suit. This is a factory-fit and is not suitable for retro-fitting! Commonly 50v, OK for 12v to 36v but not for 48v which requires 63v capacitors. This feature is not fitted to Uni series controllers. 12v, 24v and 36v controllers all use 47v. The position on the overvoltage zener is marked OVZ on the drawing above. The pot circuit consists of a 10K resistor feeding the battery supply to a 6v2 to give a stable reference voltage to the pot. For 12v operation this resistor is reduced to 1K. If this resistor is not changed, the zener voltage will not be reached. However the 12v value of 1K can be used on 24v or 36v, but both zener and resistor will get hot (though within their ratings).